St Rose Philippine Duchesne established the first house of the Society of the Sacred Heart outside of France, and she is the second saint of the Society. Philippine, as she was known, had joined the Visitation order before the Revolution of 1791. In 1801, she tried to re-establish the convent at St Marie d’en Haut which had been dispersed by the Revolution. When she came into contact with the Society of the Sacred Heart through Fr Joseph Varin, she readily joined the fledgling foundation. From their first meeting, Philippine and St Madeleine Sophie Barat were firm friends. Philippine had a strong desire to go as a missionary to share the love of God with the American Indians, and asked repeatedly to be sent. In 1818 she and four companions went to St Charles, Missouri in response to a request from the Bishop of Louisiana. Frontier life was extremely difficult. 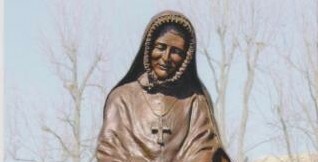 Although she founded schools and convents, Philippine considered herself a failure, and it was not until 1841, at the age of 72, that she was finally able to join the Jesuits’ mission at Sugar Creek, Kansas among the Potawatomi people. It was the Potawatomi who gave her the name “the woman who prays always”. In 1842 she returned to St Charles under obedience because of concerns about her health. She died in St Charles in 1852. “Who is she for us: a courageous, sensitive woman; a deeply prayerful religious; a lover of poverty and simplicity; a loyal, suffering daughter of the Church; a pioneer into the future who dared to go where few had gone before? She is saying something to us with urgency and insistence. What impresses me about Philippine is her ability to respond to difficult events and times; to accept and love a new and totally different country and way of life; to enter wholeheartedly into another culture, language and system of values and to appreciate these. 29 August 1769, Rose Philippine Duchesne is born in Grenoble, France. 1787, Philippine becomes a novice in the Visitation order. 1801, Philippine attempts to re-establish the Visitation convent at St Marie d’en Haut which had been dispersed by the Revolution of 1791. 1804, Philippine joins the Society of the Sacred Heart. 1818, Philippine and four younger companions establish the first house of the Society outside of France, at St Charles Missouri. 1818, Philippine establishes the first free school west of the Mississippi. 1841, Philippine spends a year with the Potawatomi at Sugar Creek, Kansas. 1842, Philippine returns to St Charles. 18 November 1852, Philippine dies at St Charles. 1940, Philippine is beatified by Pope Pius XII. 1988, Philippine is canonised by Saint John Paul II. To find more resources on St Rose Philippine Duchesne on this website, click here.